Biological waste water treatment is worldwide the most important process used for both municipal and industrial waste water. Since decades the activated sludge process dominates the treatment. Beside that biofilm processes represent a growing niche in waste water treatment, which does offer some advantages compared suspended biomass. Among the common biofilm reactors trickling filters and biofilters have been the most used systems to remove organic carbon and nitrogen from waste water within the last decades. 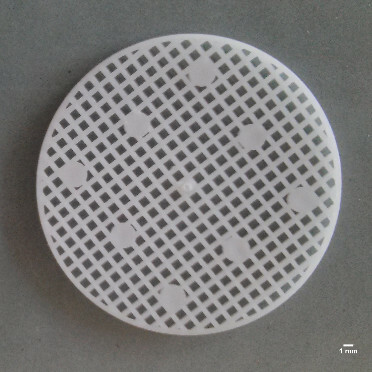 Whereas trickling filters are not perfectly designed for denitrification on the one side biofilters do have the limitation of higher energy costs on the other side. Our research does focus on a variety of biofilm reactors, among which are moving bed biofilm reactors (MBBR), aerobic granular reactors and membrane biofilm reactors (MBfR). 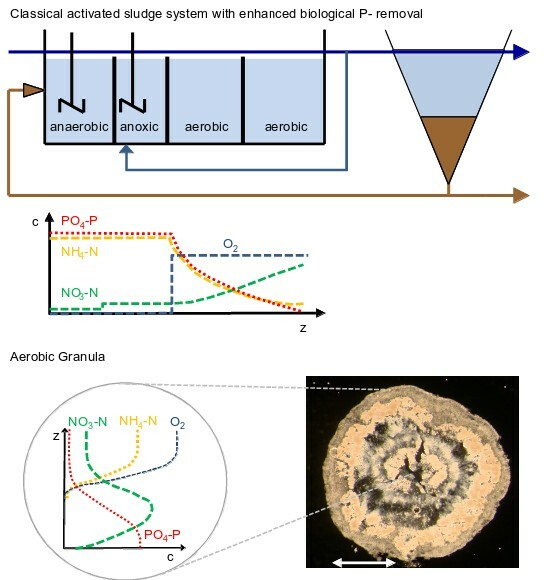 Aerobic granular reactors are mean while accepted as alternative to the classical activated sludge process. The following figure shows that both biological phosphorus and nitrogen removal can be done in one reactor (organized as sequencing batch reactor, SBR) if certain boundary conditions are kept. In aerobic granular reactors biomass organize itself as compact fluidized biofilm structure (not as floc). On the one hand the process needs more control on the other hand the foot print of such reactors is much smaller as higher biomass concentrations can be achieved and the separation of granules and treated waste water can be done in less than 10 minutes. Especially the latter does save a lot of time which can be used for reaction, i.e. phosphorus and nitrogen removal. The figure above shows the main processes in biological waste water treatment. The upper image shows the classical activated sludge treatment with minimum three tanks plus sedimentation tank. The lower image shows all the processes in one granular which can be done in one tank designed as SBR (scale bar is 1 mm).